This page has a large selection of basic multiplication printables for teaching basic facts through 12x12. Download and print classroom games, quizzes, mystery picture worksheets, flashcards, and much more. If you're teaching basic facts between 0 and 10 only, you may want to jump to our Multiplication 0-10 page. This is a whole-class chain reaction game for reviewing basic multiplication facts up to 12. Lay all of the cards on the table face-down. Players take turns trying to find multiplication facts and their matches. Cut and glue to create a board game with question cards. Travel to the moon as you answer basic multiplication facts. When playing this game, students roll a die. The number they roll corresponds to a column of math facts on the game board. Students read and answer the facts as quickly as possible. Practice basic multiplication from 0-12 with this printable puzzle activity. Circle each multiplication fact you find on this number hunt. There are 20 facts to find. Copy these flashcards (large) on card stock and let your students cut them out and practice with them. Copy these flashcards (small) on card stock and let your students cut them out and practice with them. Practice basic multiplication facts with these triangular fact family cards. Scissors and a glue stick are needed for this multiplication worksheet. Cut out the number boxes on the page and glue them to the appropriate box. Why did the girl eat her homework? To find the funny answer to this riddle, students will need to solve 41 multiplication facts. Multiply the numbers on the wheel-shaped puzzle. Write the answers to the multiplication facts, then write X or O over the corresponding numbers on the tic-tac-toe board. Unscramble the digits in each box to create a basic fact. Word problems to practice multiplying by 12s only. There are twenty multiplication facts on this page. Each one has a missing factor. Write the missing number for each problem. Up to 12 times 12. Complete the multiplication number bonds. Includes facts up to 12s. Write the answers to these multiplication facts on this printable caterpillar worksheet. These multiplication problems all have factors of 12 or less. Decode the symbols using the cypher to reveal the mystery numbers. Then multiply the factors together and write the products. Insert factors that will complete the puzzle grid to make the given products. This worksheet shows fruit divided into groups. Students use repeated addition to find the totals. Then write each as a multiplication fact. Use models to solve multiplication facts using repeated addition. This is a complete, full-page multiplication chart with all boxes filled in. This PDF has a blank multiplication table (up to 12) that students can fill in. This chart is partly filled in, but student have to fill in the remaining boxes. This multiplication table has number 0 through 12 on the X and Y axis, but the numbers aren't in order. This document has four miniature multiplication tables on a single page. Cut them out for your kids to use as a reference tool. Here is a different style chart. It has all facts listed. Answers not included. This is just like the chart above, but this version does show products. Make your own basic multiplication worksheets. You choose the range for the first and second factor. This generator allows you to create worksheets with 25 or 50 problems. 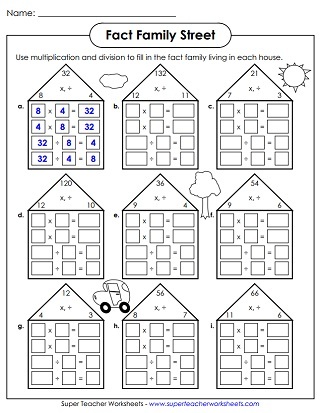 Help your students explore the relationship between division and multiplication with this fact family worksheet. Students are presented with a number family. They have to write two division and two multiplication facts for each. Write the missing number for each factor-factor-product box. Complete each number family by writing the missing value in the empty circles. Here's the last multiplication quiz in the set. Facts include 0s, 1s, 2s, 3s, 4s, 5s, 6s, 7s, 8s, 9s, 10s, 11s, and 12s. This fifty question quiz has facts up to twelve times twelve. This PDF contains the third version of the 0 through 12 multiplication quiz. 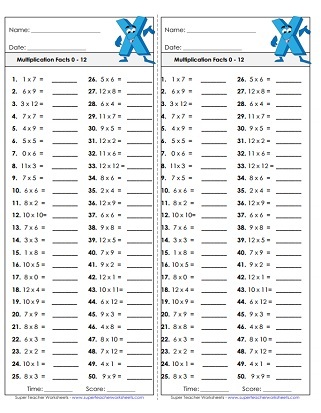 Basic Multiplication Facts 0 - 12. This worksheet has a camping theme. This multiplication drill sheet has pictures of funny ducks. There are 39 problems in all. 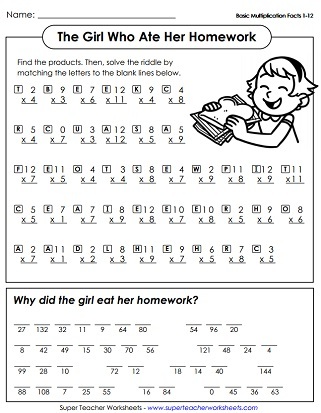 If you're only teaching basic facts up to 10, try the worksheets and games on this page. This index page will link you to many more multiplication sections on our site. This page has fact families and number bonds for teaching students about the relationships between multiplication and division. Learn about the associative, distributive, and commutative properties with these printables. More advanced multiplication activities, with multiple digits can be found in this section of the site.